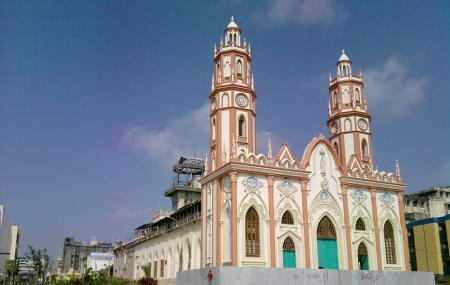 Located at the heart of the city St. Nicolas church has been under construction since the 17th century. A beautiful church with a strong Neo Gothic architecture it contains an invaluable relic, a piece of bone of St. Nicolas is embedded inside the altar. The San Nicolas Plaza is located just outside the church and is an important location for festivities and celebration. How popular is Iglesia De San Nicolas De Tolentino? People normally club together Museo Del Caribe and Estacion Montoya while planning their visit to Iglesia De San Nicolas De Tolentino. Must visit place in Barranquilla to feel the local atmosphere. But still be aware Locals might call you gringo or chino. Beautiful church to visit and pray. Beautiful sacred site, icon representative of the city. Es un sitio muy representativo de la historia de Barranquilla, está rodeados por pequeños comerciantes donde se pueden encontrar buenos precios para artículos nuevos o de segunda, especialmente libros. La zona es totalmente peatonal por lo cual se puede caminar sin problemas.